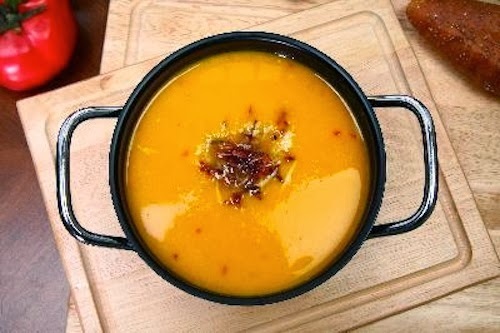 Fragrant, sweet and spicy, this butternut squash soup is spiked with Thai flavors. I love the combination here of curry and coconut milk, and added Thai bird red chili pepper for an extra kick. Pumpkin can also be used in place of the squash in this recipe; both will give the immune system a powerful beta-carotene boost. You can buy Thai bird chilies in Asian grocery stores. I pack them in plastic wrap and freeze them in zip-lock bags for later use.You can substitute bird chilies with other high-heat chilies. 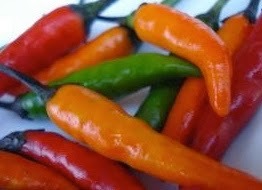 Serranos (quite a bit milder though) would be a good substitute. Jalapenos would be an ‘okay’ substitute but I find that it adds too much of a green pepper flavor and not enough heat. red pepper flakes or a dollop of So Delicious plain "Greek Style" cultured coconut milk yogurt for garnishing. In a large pot over medium heat, warm the olive oil. Add the onions and cook until softened, 2 to 3 minutes. Add the ginger and garlic and cook until fragrant but not browned, about 1 minute more. Add the squash, broth and the 1/2 teaspoon salt, increase the heat to high and bring to a boil. Reduce the heat to maintain a simmer, cover and cook until the squash is tender when pierced with a fork, about 25 minutes. Let cool slightly. Put the curry paste in a small bowl and stir in the coconut milk until well blended. Using either an immersion blender (my preference) or food processor, puree the soup until smooth. Return the soup to the pot and stir in the coconut milk mixture. Heat the soup until just hot, then stir in the Thai bird chili, lime juice and adjust the seasoning with salt and ground pepper. Ladle the soup into warm bowls and serve immediately. Garnish with yogurt or red pepper flakes. Serve with your favorite gluten free rolls. Note: I like the Udi's Classic French Dinner Rolls or French Baguettes.